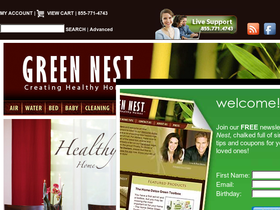 Use this coupon code to get $5 off your purchase of $10 or more from Green Nest. Click link to save $50 on the Healthy Home Vacuum from GreenNest.com. Save $40 on the Nursery Package from Green Nest. Package includes Baby's Breath Allergy Machine, Bath Ball Filter, Green Nest All Purpose Cleaner, & My Body My House, by Lisa Beres. Click link for view. Save $35 on select organic robes from GreenNest.com. Click link for selection. Enjoy a $10 savings on the Jacquard Baby Blanket from GreenNest.com. Click link. Save up to 50% off those necessary green items from Green Nest and check out their Sale section.